The Boston Marathon exerts a strong centripetal force on the region, unifying the city and its neighbors in daylong rally that is as much about the race as it is a show of provincial pride. Nowhere is this dynamic more apparent than in the homes, businesses and schools that line the route between Hopkinton and Copley Square. 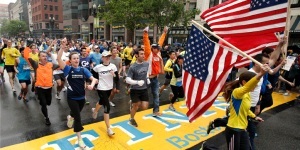 And at no time is the sentiment more palpable than now, a year after twin bombings rocked the finish line. Use the map below to navigate the course and discover the stories of people who live and work along the route -- what the marathon means to them, and how the bombing impacts their connection to the race. The Boston Marathon weaves through quintessential New England — it starts in residential neighborhoods in Hopkinton and Ashland, climbs up Heartbreak Hill right near Boston College's campus, and culminates in Boston's Copley Square. People who live and work along the route share their stories of what the marathon means to them, and how last year's bombings impacted that. Use this map to navigate the course and discover their stories. Please upgrade to a modern browser for full experience (IE9+). On race day, for 25 years, Judy Keefe’s home near the Boston Marathon’s starting line in Hopkinton was a hive of activity: Associated Press photographers developing film in the upstairs bathroom, local luminaries in the basement prepping to run, friends and families partying on the main floor. At the center was Keefe, a spry, upbeat woman who cooked all the food and asked nothing in return. Many people would have been overwhelmed, but she enjoyed the company — and embraced what she saw as a sort of civic duty. "It was always a social event to me," Keefe, 69, said. As she got older, and the race’s start time was moved to early morning, and the size of the field exploded, the magic of those early years faded. Her gatherings are much more muted. After last year's bombings, she worries about someone "doing something stupid" at the start line. But her eyes still sparkle when she talks about the race: her hometown pride, the memories dating back to her grammar school days, a life entwined with the Boston Marathon. Feelings no terror attack could dampen. On race day, for 25 years, Judy Keefe’s home near the Boston Marathon's starting line in Hopkinton was a hive of activity: photographers developing film in the upstairs bathroom, local luminaries in the basement prepping to run, friends partying on the main floor. Many people would have been overwhelmed, but she enjoyed the company - and embraced what she saw as a sort of civic duty. "It was always a social event to me," Keefe, 69, said. Rick Macmillan has lived his entire life in Hopkinton, most of it in a house on East Main Street, a stone's throw from the Boston Marathon starting line. As a young boy in the 1950s, he began carrying a bound, imitation-leather autograph book as he loitered among the elite runners, collecting signatures. Today, that book is filled with names of legends, including Bill Rodgers, Johnny Kelley and Sara Mae Berman. Macmillan grew up to be the fire chief, and played a key role in the town's race-day preparations. At home, his wife, Jennifer, hosted politicians, race organizers and athletes. Now he's retired, and stays behind for the party. Although it was 26 miles away, and they knew none of the victims, the bombing rattled the Macmillans: if it happened at the finish line, it could also happen at the start. Officials have advised them to keep close watch of who they let into their home. But Macmillan, 67, still feels the delight that he did as a young boy. "I'm proud to be a part of it," he said. Rick Macmillan has lived his entire life in Hopkinton, most of it in a house on Main Street, a stone’s throw from the Boston Marathon starting line. As a young boy in the 1950s, he began carrying an imitation-leather bound autograph book as he loitered among the elite runners, collecting signatures. Today, that book is filled with names of legends, including Bill Rodgers, Johnny Kelley, Sara Mae Berman. He grew up to be the fire chief, playing a key role in race preparation and hosting athletes and organizers at his home. Jane Nelson has been watching the Boston Marathon since she was a little girl in Framingham, when the coolest thing about the race was that it offered a day off school. But she soon recognized that the Patriots Day race had much deeper significance: It tied the community together, and celebrated the region's role as a cradle of U.S. history. That is why she unfailingly dresses in a gaudy red, white and blue outfit while cheering alongside her colleagues and friends at Silton Glass, which sits on the marathon route. "It's very American — an apple pie and baseball kind of thing," Nelson, 64, said. If anyone at Silton knows someone running the race, their name is put up in large letters on the Silton Glass sign that rises above Waverly Street. And if anyone wonders if the bombers stifled people's enthusiasm, Nelson has an answer: "They ticked us off and they got our backs up, and there's no way they're going to ruin this for us." Jane Nelson has been watching the Boston Marathon since she was a little girl in Framingham, when coolest thing about the race was that it offered a day off school. But she soon recognized that the Patriot’s Day race had much deeper significance: It tied the community together and celebrated the region’s role as a cradle of U.S. history. That is why she unfailingly dresses in a gaudy red, white and blue outfit while cheering alongside her colleagues and friends at Silton Glass, an auto repair business that sits on the marathon route. "It's very American — an apple pie and baseball kind of thing," Nelson, 64, said. Brian Donovan's earliest Boston Marathon memory is standing on the sideline when he was 4 to watch his father, a runner, who picked him up as friends cheered. From that moment, Donovan was hooked, and he went on to run several Boston Marathons himself. And so it seemed fitting when Donovan, 39, and his wife bought a house on the route in Natick. He keeps in mind something his dad always told him, that everyone who finished the marathon was a hero. That seems particularly apt this year, with thousands of runners returning, seeking to finish what they could not last year. And despite any lingering fears of a copycat attack, Donovan plans to be out there, cheering with friends and family, just like any other year, only with more passion. "Like a middle finger to terrorism," he said. Brian Donovan's earliest Boston Marathon memory is standing on the sideline when he was 4 and watching his father run past, then turn around to pick him up. From that moment, Donovan was hooked, and he went on to run several Boston Marathons himself. Ever wonder how those hundreds of screaming, sign-toting Wellesley College students learn to form the annual "Scream Tunnel" on Central Street? While the tradition gets passed down by word of mouth, the daylong throng also requires a degree of organization. This year, that coordination is being led by Molly Tyler, a 21-year-old senior from Somerville. Tyler had never watched the marathon in person before coming to Wellesley. But she was sucked into it her freshman year, and is now leading efforts to help "take back the marathon" with an especially enthusiastic post-bombing turnout. Requests for personalized signs are way up, many from runners who couldn’t finish last year, Tyler said. "That’s why we want to make it even better than before," she said. At Wellesley College, home of the famous "Scream Tunnel," students plan on making the post-bombing ritual especially enthusiastic. The goal is to "take back the marathon," organizer Molly Tyler said. Kym Havens, 46, is an assistant manager at Wellesley Books, which lies near the marathon's halfway mark. While many businesses along the marathon route close for the race, Wellesley Books stays open — not so much for sales, but to join in the festive atmosphere. "That's one of the reasons we stay open — just because we enjoy it," Havens said. She's originally from nearby Framingham, also on the route, and lived for many years in California before returning. "I've seen no other place with the same kind of community pride," she said. Last year, runners were still moving through downtown Wellesley when news of the bombing brought things to a halt. But the attack actually strengthened the sense of civic solidarity. For example: it was fairly common to hear people complain about the traffic tie-ups on marathon day, but this year such sentiment seems much more muted. "The bombing was horrible, but it brought people together," Havens said. Kym Havens, 46, is an assistant manager at Wellesley Books, which lies near the marathon’s halfway mark. While many businesses along the marathon route close for the race, Wellesley Books stays open — not so much for sales, but to join in the festive atmosphere. "That's one of the reasons we stay open - just because we enjoy it," Havens said. Eric Barry, a photographer whose studio faces the marathon route in Wellesley, tries to explain what the race means to him with a story about a brief encounter with a runner last year. Barry was on the sidewalk cheering, beer in hand, when the runner, who didn't speak English, approached him and began making motions as if he needed a drink. Barry started to go inside for some water, but the runner grabbed his beer, chugged it, thanked him and rejoined the race. That fleeting connection left Barry with a greater appreciation of the global, communal spirit of the marathon. "It transcends the sport," Barry, 40, said. Not long after that encounter, the bombers struck. The sense of fear that followed has since ebbed, replaced by a determination to experience the "world-wide community feeling" that is the Boston Marathon, Barry said. And he's bringing his family, "if just to say we're not scared." A brief encounter with a foreign runner last year made Eric Barry appreciated the sense of international community that pervades the Boston Marathon. The bombing has only strengthened that spirit, he said. "It transcends the sport." The firehouse at the corner of Washington Street and Commonwealth Avenue in Newton is a landmark of the Boston Marathon route. The firefighters who work there like to say that the building represents a turning point in the race, literally and figuratively, as competitors turn the corner and find themselves at the base of Heartbreak Hill. But even on non-race days, the firehouse is a popular gathering point and way station for runners in training. "It's a marker, a rest stop, a place to get water, year-round," said Lt. Tom Lopez, a union leader who arranged for the "Boston Strong" banner that has hung from the building's facade since the week of the bombing. Lopez said he's noticed an increase in the number of runners training for the 2014 marathon, fighting through the unusually brutal winter conditions. "As cold as it's been, people are out there every day," he said. That determination applies to the surrounding community as well, Lopez said. "I have not had anybody say to me that they're not going to go to the race. People say, 'I can't wait to be there.' I hear nothing but resolve." The firehouse at the corner of Washington Street and Commonwealth Avenue in Newton is a landmark of the Boston Marathon route. "It's a marker, a rest stop, a place to get water, year-round,” said Lt. Tom Lopez, a union leader who arranged for the "Boston Strong" banner that has hung from the building’s facade since the week of the bombing. Lopez said he's noticed an increase in the number of runners training for the 2014 marathon, fighting through the unusually brutal winter conditions. “As cold as it’s been, poeple are out there every day," he said. That determination applies to the surrounding community as well, Lopez said. "I have not had anyobody say to me that they’re not going to go to the race. People say, ‘I can’t wait to be there.’ I hear nothing but resolve." Rebecca Kagle, 22, grew up in a townhouse on Beacon Street in Brookline. Her oldest marathon memories are of spending the race on the street, selling lemonade to spectators. "For little kids, we did well," she said. When Kagle outgrew the lemonade stand, she joined family and friends on the townhouse roof, where the view of the marathon was flawless. Occasionally, she went downtown to watch near the finish line, but the perspective was never as good. Then she left town for college, where she enjoyed telling people she lived on the marathon route. "You feel a sense of pride that so many people feel a connection to Boston," she said. She was at school when the bombers struck, so she doesn’t have the visceral memories of that day. But she relates with people who say they’re looking forward to this year’s race more than usual. "It’s definitely unique, and creates a sense of unity within the city," she said. As a young girl, Rebecca Kagle sold lemonade outside her family's Brookline townhouse. As a teenager, she watched from the roof. She was away at college when the bombers struck, but now, at 22, she's back. "You feel a sense of pride that so many people feel a connection to Boston," she said. Erinn Fleming always said she would never run a marathon. That was before she witnessed the marathon bombing from up-close -- she was working at the Forum Restaurant on Boylston Street, right by the Boston Marathon finish line, when the bombs exploded last year. Now, with a steely resolve that was born when those bombs exploded so close to her, Fleming is preparing to run in this year's race. "I know that I have said that I would never run a marathon," she said. "And here I am." She knows that the last stretch, as she runs by the Forum and approaches the finish line, will be the most difficult. "That will be emotional," she said. "That's when I will think about last year, and I'm hoping my friends here at Forum who will be working will stop what they're doing to come outside and cheer me on." Erinn Fleming always said she would never run a marathon. She's just not a marathon person. That was before she witnessed the Marathon bombing from up-close -- she was working at the Forum Restaurant on Boylston Street, right by the Boston Marathon finish line, when the bombs exploded. Now, with a steely resolve that was born when those bombs exploded just so close to her, Fleming is preparing to run in this year's race. 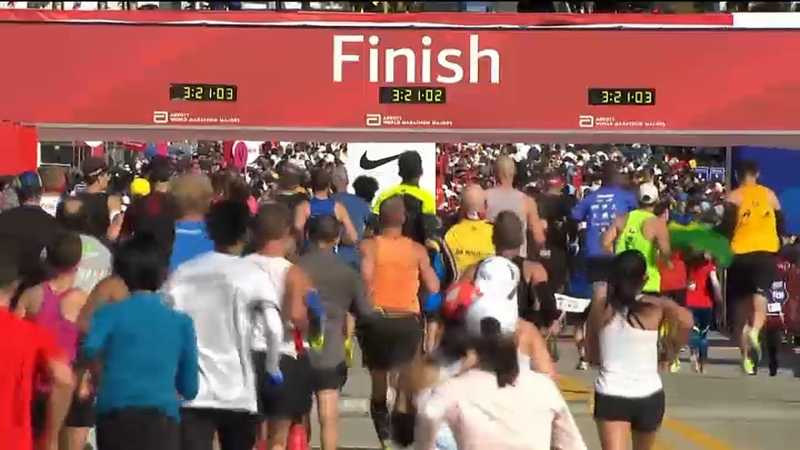 She knows that last stretch, as she runs by the Forum and approaches the finish line, will be the most difficult. "That will be emotional," she said. "That's when I will think about last year, and I'm hoping my friends here at Forum who will be working will stop what they're doing to come outside and cheer me on." For years, volunteers at Boston's Old South Church would sit in one of the church's upper rooms, so close to the marathon's finish line, and knit. They'd make prayer shawls and give them to people near and far — from Boston's Back Bay to as far away as Ethiopia. This year, they're knitting for a different reason: They're making scarves for marathon runners, to distribute with a blessing at a prayer service the day before the race. Marilyn Jackson Adams, the project's organizer, is knitting for her son, who ran in last year's marathon but finished in Kenmore Square, instead of Boylston Street, because of the bombings. He plans to run again in this year's marathon. "This is helping me to show my son how I feel about him and his courage," she said. The church's knitters asked for help: They hope to make about 30,000 scarves, and know they can't do it themselves. "To the best of our knowledge, we have people knitting from 27 states," volunteer Diane Gaucher said. "This is just the beginning." For years, volunteers at Boston's Old South Church would sit in one of the church's upper rooms, so close to the marathon's finish line, and knit. They'd make prayer shawls and give them to people near and far — from Boston's Back Bay to as far away as Ethiopia. This year, they're knitting for a different reason: They're making scarves for marathon runners, to distribute with a blessing at a prayer service the day before the race. April 15, 2013 2:59 P.M. Four hours into the race, twin blasts rip through the finish line at the Boston Marathon about 100 yards apart. Video footage shows the two people later identified as suspects on Boylston Street prior to the explosions. The blasts kill three people and injure more than 200. April 18, 2013 5:10 P.M. Three days after the explosions, investigators release photographs and video of two suspects. They ask for the public's help in identifying the men. 10:30 P.M. MIT campus police officer Sean Collier is shot multiple times in his vehicle following a confrontation with the bombing suspects, authorities say. He is later pronounced dead. 10:45 P.M. The suspects carjack a Mercedes SUV in Cambridge, authorities say, and force the driver to go to an ATM and give them his card and password. They then go to a convenience store, where the driver escapes unharmed. April 19, 2013 1:00 A.M. Authorities spot the stolen car in neighboring Watertown. The carjackers throw at least two small explosives from the car and gunfire ensues. One of them, later identified as Tamerlan Tsarnaev, 26, is critically injured and later pronounced dead. The second suspect flees in the car. A transit police officer is seriously injured. Soon after, officials shut down mass transit in Boston and ask everyone to stay indoors -- putting the city in virtual lockdown. 5:13 A.M. Police say one suspect is dead. They release a new photo of suspect on the loose. 6:35 A.M. The suspects are identified by law enforcement officials and a family member as brothers Dzhokhar and Tamerlan Tsarnaev, ethnic Chechens who grew up in Dagestan, which neighbors Chechnya in southern Russia. Officials later said Tamerlan visited Dagestan for six months in 2012. 6:44 A.M. Dzhokhar Tsarnaev, 19, is identified as surviving suspect. Authorities say Tsarnaev is still at large and should be considered armed and dangerous. 9:40 A.M. Anzor Tsarnaev, the father of the bombing suspects, says Dzhokhar is a smart and accomplished young man. "My son is a true angel," he says. "Dzhokhar is a second-year medical student in the U.S. He is such an intelligent boy. We expected him to come on holidays here." 9:51 A.M. Tactical teams drive through neighborhoods while searching for Dzhokhar Tsarnaev in Watertown, Mass. 11:41 A.M. Boston bombing suspect's uncle Ruslan Tsarni tells a throng of reporters outside his home in Montgomery Village, Md. “Turn yourself in, and ask forgiveness” from the victims. 7:36 P.M. Police in armored vehicles and tactical gear rush into a Watertown neighborhood after gunfire erupts. 8:10 P.M. Boston Mayor Tom Menino tells WBZ-TV the suspect is holed up in a boat parked in a backyard in Watertown. 8:45 P.M. Bloody and battered, Tsarnaev emerges from the boat and is captured by police. April 22, 2013 Federal prosecutors charge bombing suspect Dzhokhar Tsarnaev with conspiring to use a weapon of mass destruction to kill for what they say was his role in the bombing the Boston Marathon. Authorities charge him in his Boston hospital room, where he is being treated for bullet wounds. April 25, 2013 Authorities say the suspects discussed going to New York City to detonate the rest of their explosives in Times Square, but the plan never materialized because they ran out of gas and then got into a gunfight with police, officials said. April 25, 2013 Zubeidat Tsarnaeva, the mother of the two suspects, speaks at a news conference in Makhachkala, the southern Russian province of Dagestan. She insists that her sons are innocent. "It's all lies and hypocrisy," she told The Associated Press in Dagestan. "I'm sick and tired of all this nonsense that they make up about me and my children." April 26, 2013 Tsarnaev is moved from a hospital to a federal prison medical center. FBI agents shift the focus of their investigation to how the deadly plot was pulled off and search for evidence in a landfill near the college he attended. April 28, 2013 Russian authorities tell U.S. investigators they recorded a 2011 telephone conversation between Tamerlan Tsarnaev and his mother in which the pair discussed jihad, a source briefed on the investigation told NBC News. April 29, 2013 Attorney Judy Clarke joinw Dzhokhar Tsarnaev's defense team. Clarke previously represented Jared Loughner, who killed six people and seriously wounded former U.S. congresswoman Gabrielle Giffords in 2011; Eric Rudolph, who pleaded guilty to being the 1996 Atlanta Olympics bomber; Ted Kaczynski, the Unabomber; and Zacarias Moussaoui, a convicted Sept. 11 conspirator. May 1, 2013 Relatives of Tamerlan Tsarnaev claim his body after his wife agrees to release it, an uncle said. An FBI affidavit says Azamat Tazhayakov and Dias Kadyrbayev, both 19, agreed to get rid of friend Dzhokhar Tsarnaev's backpack after concluding from news reports that he was one of the bombers. Tazhayakov and Kadyrbayev are charged with conspiring to obstruct justice. A third friend, Robel Phillipos, also 19 years old, is charged with making false statements to federal investigators. According to the complaint, Phillipos lied to investigators during their initial interviews, giving them conflicting accounts of the night of April 18 and concealing that he and his friends had gone to Tsarnaev's dorm room. Tazhayakov and Kadyrbayev were in custody for more than a week on allegations that they violated their student visas. May 22, 2013 Ibragim Todashev, an amateur boxer and friend of Tamerlan Tsarnaev, is shot and killed by an FBI agent when he allegedly attacked the agent during an interview in Florida about the bombings and a Sept. 11, 2011 triple homicide of three Walthem, Mass. men. Todashev was about to write a formal statement that implicated himself and Tsarnaev in the homicides before he attacked the agent, officials said. July 10, 2013 Tsarnaev pleads not guilty to 30 charges in his first public court appearance. July 17, 2013 Rolling Stone magazine draws harsh criticism from readers for a cover photo that features Dzhokhar Tsarnaev. Mayor Tom Menino slams the editors for rewarding a "terrorist with celebrity treatment." Rolling Stone fires back, citing its "long-standing commitment to serious and thoughtful coverage of the most important political and cultural issues of our day." August 8, 2013 Dias Kadyrbayev and Azamat Tazhayakov are indicted by a federal grand jury on charges of conspiracy to obstruct justice. November 2, 2013 After winning the World Series, the Red Sox honor the bombing victims by crossing the marathon finish line at their celebratory parade. Player Jonny Gomes places the World Series trophy on the finish line and draped over it a team jersey with the words "Boston Strong 617" on the back.